Heart palpitations are more common than you think. They often come at night right before bed, or following anxiety episodes. The feeling is uncomfortable, and quite frankly, unnerving. There aren’t many effective treatments for heart palpitations, and they’re hard to track because of their random and unpredictable nature. Heart palpitations are a symptom, not a condition, and there are many different causes for it. This makes finding an effective treatment a bit of a challenge. Fortunately, there are excellent herbs available that can help with this symptom, and in some cases, the underlying cause of the heart palpitations. Here, we discuss the potential causes of heart palpitations, and some herbs you can incorporate into your routine to get rid of them for good. In the medical world, heart palpitations are often referred to as cardiac dysrhythmias. Translating this we get; dysfunctional (dys–) and heart rhythms (–rythmia). Heart palpitation is the word to describe the symptom of the dysrhythmia. It’s a term that describes our ability to sense abnormal heartbeats. The symptoms can last anywhere from a few seconds to days. Other times, the heart might feel like it’s beating too slowly (bradycardia), or too quickly (tachycardia). In most cases, there is a traceable underlying cause of the heart palpitations, which usually don’t indicate any serious heart disease. In some cases, however, heart palpitations can indicate serious underlying cardiovascular disease. If you’re experiencing heart palpitations, it’s a good idea to have it investigated by a doctor. Doctors have access to machines called ECG (electrocardiogram) used to analyze your heart rhythm and pick up on any “red flags”. In most cases, there is nothing directly wrong with the heart. The palpitations are a byproduct of something else. Long-term, if the problem persists, it can lead to serious problems with the cardiovascular system. Atrial fibrillation, for example, increases the risk of stroke 5-fold and accounts for roughly 15% of all strokes . Luckily, there are a lot of things you can do to reduce your chances of this happening, and alleviate the discomfort brought on by heart palpitations. There are a few different types of dysrhythmias that get lumped together under heart palpitations. We can break them down into 2 main categories, those affecting the top of the heart (atria), and the bottom of the heart (ventricles). The most common forms of atrial dysrhythmias are atrial fibrillation and atrial flutter. They are the most prevalent causes of heart palpitations. Atrial fibrillation involves a chaotic firing of the electrical signals in the atrium of the heart. When this happens, the atrium can’t do its job effectively, which is to move blood into the ventricles where it is then pumped around the body. The heart relies on special electrical regulators known as the pacemakers to maintain a regular heartbeat. The main pacemaker of the heart, the sinoatrial node (SA node) is located in the atria. It’s tasked with keeping the heartbeat as directed by the brain. 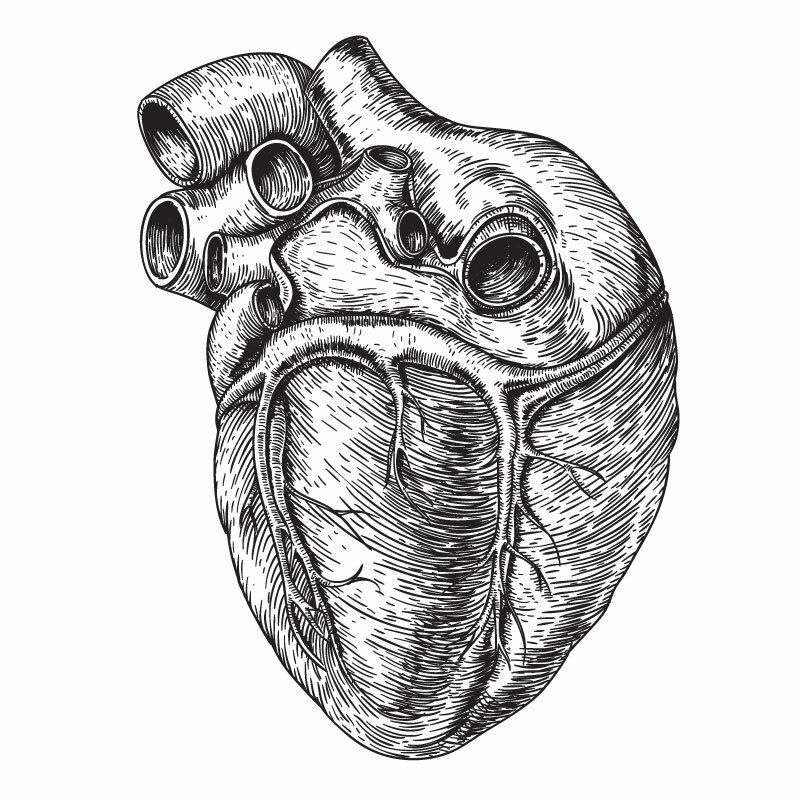 It fires electrical impulses causing the atrium to contract and force blood into the ventricles below. This same signal then goes to another pacemaker in the ventricles, where the signal is delayed, allowing blood to flow from the atrium into the chambers of the ventricles. The signal is then released, causing the ventricles to contract with a great deal of force. This pumps blood out to the rest of the body, into the lungs, and far reaches of the limbs. Since the SA node in the atria is the primary regulator of the heartbeat, it makes sense that this is the most common source of problems. It’s most common in men than women generally, however, it’s a lot more common in women after menopause, roughly matching the frequency in males . The most common causes of atrial fibrillation and the heart palpitations it produces is anxiety, alcohol, and menopausal changes. From a technical standpoint, atrial fibrillation is caused by differences in calcium ion and potassium ion handling in the electroconductive myocytes making up the heart. These ions are responsible for generating the electrical impulses that make the heart contract. They flow in and out of the muscle cells to give it a positive or negative charge when appropriate. When these signals are dysfunctional, it can cause the cells to fire and contract sooner than they’re meant to, causing the atria to quiver uncontrollably. Therefore, any condition that changes the electrical system (calcium, potassium, and sodium ions) can lead to fibrillation and heart palpitations. Ventricular dysrhythmia are similar to atrial dysrhythmia but affects the ventricles of the heart instead. The ventricles are the larger part of the heart that pushes blood to the lungs (right ventricle) and the body (left ventricle). There are many different forms of this, but the most common is something called a premature ventricular contraction, PVC for short. This type of fibrillation is caused by dysfunctional electrical impulses in the heart. Normally the electrical signal start at the SA node in the atria, causing the atria to contract and sends the electrical impulse downwards to the AV node in the ventricles. This AV node delays the signal to allow the atria to push blood into the ventricles. Then, the AV node releases the signal, causing the ventricles to contract. In PVC, this signal is either released too early, or a second source of electrical activation originates from elsewhere in the heart muscle, causing an unexpected contraction and producing symptoms of heart palpitations. In some cases, ventricular dysrhythmias can indicate more severe underlying heart disease. A doctor will often use tools like ECGs or Holter Monitors to measure the heart rhythm and determine whether there is something more serious going on. Anybody experiencing heart palpitations for the first time should have them investigated by a professional using these tools to rule out anything serious. Unless a specific cause for the heart palpitations is discovered (such as anxiety), treatment is often unreliable. Doctors may use drugs like beta-blockers or calcium channel-blockers to control heart rhythm. In heart disease patients, drugs that work on the sinus node controlling heart rhythm are sometimes used, usually digoxin or a similar alkaloid. In some cases, a doctor will use something called a catheter ablation. This involves cauterizing (burning) an area where the irregular electrical impulse originates. Fortunately, most cases are benign. There are many different causes of heart palpitations. Effectively using herbs to treat it will rely on identifying the cause, and addressing it directly. However, the actual cause is often hard to determine, and even when it is, it can be difficult to treat the underlying cause (valve disease or obstructive sleep apnoea for example). Herbal approaches focus on primarily stabilizing the electrical currents of the heart and addresses causative factors like overstimulation of the nervous system. Secondary management of indirect causes are implemented, such as treating metabolic disorders like diabetes. Ask any herbalist what their number one heart-herb is, and they’ll likely tell you hawthorn. This modest looking tree is actually a cardiac powerhouse. It offers some of the most well-rounded and diverse benefits towards heart function out of any other herb on earth. Hawthorn is useful for treating atherosclerosis (hardening of the arteries), high cholesterol, congestive heart failure, and is commonly used after a heart attack to help prevent further damage to the heart tissue. One of the most important actions of hawthorn is its ability to regulate the electrical activity of the heart, making it very useful for treating heart palpitations. Most of the research involving hawthorn and heart palpitations is focused on ventricular fibrillation [8-10], however, many of its effects are directly relevant to atrial fibrillation as well. Hawthorn is also useful for people experiencing heart palpitations with existing heart disease.. A large meta-analysis involving 5500 people concluded that a standardized hawthorn extract (WS 1442) reduced sudden cardiac death in patients with existing heart disease by 25-35% . This is the most reliable herb I know of for reducing the symptoms of heart palpitations but it’s important to note that it can take as long as 2 weeks before any benefits are noticed. In order to get the most out of hawthorn, you need to take it every day for several weeks at a time. When taking hawthorn for heart palpitations, you shouldn’t expect any improvement during the first week, but you could expect a gradual decrease in both frequency and severity of palpitations over the next couple of weeks. A large meta-analysis investigating several large clinical trials done on hawthorn, looked at the safety of the herb in combination with common pharmaceuticals used to treat heart disease. The analysis looked at a total of 5577 patients and concluded that Hawthorn had very few drug interactions with the most commonly used heart medications . This herb is very safe, but anybody taking heart medications should always consult their doctor before taking any herbs or supplements. Motherwort is a member of the mint family. This family is densely populated with medicinal plant species with a variety of different specialties. Motherwort’s specialty is on the cardiovascular system. Its main use istreating rapid heartbeats, heart palpitations, and anxiety. It contains a group of chemicals known as glycosides. These compounds have been shown to have cardiotonic activity in an older German study published in 1961 . More recent studies have found similar results. Using an ECG machine to measure dysfunctional heartbeats in rats, researchers found a return to normal heart rhythm after treatment with motherwort glycosides . Although animal studies like these are a far reach from human trials, it provides useful insight into how the plant exerts its effects. Similarly to Hawthorn, motherwort should be taken for long periods of time to get the best results. Although you can make motherwort tea, it needs to be very strong to produce the desired effects. A better option is to get a tincture or capsule of motherwort. Make sure you follow the dose on the label. Reishi isn’t a herb people generally think of in relation to heart palpitations, but I’ve found it to be very useful for this. In traditional Chinese medicine, heart palpitations are thought to be the result of what they call “shen disturbances”, “yin deficiency”, and “Qi and blood deficiencies”. Shen is thought of as the ‘spiritual’ element of a person’s psyche. It ‘lives’ in the heart, so when there are problems with shen they tend to show up in the heart. Yin is the passive, ‘female’ principle of the universe. In terms of health, it’s associated with our nutritive and restorative processes (such as the parasympathetic nervous system). ‘Yin deficiencies’ suggests problems with our recovery processes. Qi is our circulating life force. It’s the force that makes things happen within the body, some people will argue that Qi is ATP, the energy ‘currency’ of our body. Everything the body does requires ATP to power it. If there are Qi deficiencies in the heart, it could affect our heart's ability to pump effectively. Blood is self-explanatory, but in Chinese medicine, it’s intimately connected with Qi and is considered the nutritive source for the body. This can be related to a nutrient deficiency, of which many can cause heart palpitations (magnesium or potassium for example). This is another way of thinking about the causes of heart palpitations and gives us some unique insights into treatments with herbs that you wouldn’t normally think of for treating it. Reishi comes up here because it’s used to treat all of these conditions. According to The White Rabbit Institute of Healing, It’s thought to ‘calm shen’, “tonify Wei Qi and Blood”. Looking at reishi on a biochemical level, we find that it has a number of actions specific for calming the nervous system. It’s an anticonvulsant, anxiolytic (anti-anxiety), and nervine (improves nerve function) . It’s especially useful in anxiety-related heart palpitations, or if the cause is due to severe deficiency states like anorexia, anemia, or other nutrient depleted states (along with diet changes of course). Reishi also contains a diverse set of immunomodulating polysaccharides (complex sugars). These compounds are well-known for their ability to modulate the immune system . This is relevant because certain immune-related conditions, such as Grave’s hyperthyroid disease and other autoimmune conditions can cause symptoms of heart palpitations. Safety: Reishi is a safe herb and rarely interacts with other medications. However, avoid reishi if you’re taking ACE-inhibitor medications because many of their effects overlap and may cause side effects from the medication. Much like reishi, Zizyphus comes to us from traditional Chinese medicine. Zizyphus seed is an excellent anti-anxiety herb, helping to relieve anxiety-driven heart palpitations. It’s also a mild sedative especially effective for people experiencing heart palpitations while laying in bed trying to fall asleep. Many anxious people find that they can distract themselves for most of the day until they get into bed.. When you finally lay in bed and the distractions (Instagram, friends/family, television, etc) are gone, you’re left alone with your thoughts. For many people this can be a scary place. It often causes people to feel anxious resulting in palpitations for some. Zizyphus works through a neurotransmitter known as GABA , responsible for controlling our ‘rest and digest’ nervous system (parasympathetic nervous system). Zizyphus helps us fall asleep, boosts our immune function, and allows us to digest food effectively by turning on the parasympathetic nervous system. This is useful because its counterpart, the sympathetic nervous system (controls stress response and fight-or-flight), is often a primary cause of our heart palpitations. Many pharmaceuticals and herbs that boost the effects of GABA are considered to have anti-anxiety, sedative, or muscle relaxant activities. Pharmaceuticals with these effects include the benzodiazepines, which are the primary medical treatment for anxiety and are used for treating anxiety-related heart palpitations. Safety: Avoid Zizyphus with alcohol consumption and benzodiazepines due to overlapping effects. Passionflower is one of the best anti-anxiety herbs I know of. The effects are broad, and work on many different types of anxiety, but is most specific for anxiety that involves ‘racing thoughts’, or ‘racing heart’. Passionflower vine and leaves contain a set of chemicals that modulate a lot of the chemicals that regulate our cognitive functions. The overall effects are to essentially ‘turn down’ the sympathetic nervous system, making us feel more relaxed. It helps us collect our thoughts and maintain a clear, calm composure. This goes a long way in alleviating heart palpitations associated with an overactive or worried mind. Passionflower is also useful for a range of cognitive conditions, including depression, anxiety, and insomnia. Safety: Avoid passionflower with SSRI and SNRI antidepressants as well as barbiturates and benzodiazepines. In traditional Iranian medicine, lemon balm is considered one of the primary treatments for heart palpitation . Lemon balm, like motherwort, is a member of the mint family of plants. It offers a variety of benefits to the nervous system and is used to treat anxiety, depression, and insomnia in traditional herbal medicine. A randomized, double-blind study investigating the effectiveness of lemon balm for heart palpitations found a 36% reduction on average in the number of heart palpitations patients experienced compared to placebo . This is an excellent herb for nervous system conditions related to heart palpitations. Its calming effects make it useful for public speakers, or those suffering from social or generalized anxiety disorders. Safety: Lemon balm is a safe herb, caution is advised whenever taking anti-anxiety or antidepressant medications due to similar effects. Taking both at the same time could produce effects that are stronger than intended, leading to side effects. My preferred method of using herbs, especially for conditions like heart palpitations is with tinctures and liquid extracts. Tinctures and liquid extracts allow for simple, calculated dosing, and stores for a long period of time. Tinctures are a common format of herbs. You can find them at most health food shops, or online at places like Amazon, or Harmonic Arts (Canada). You can take tinctures by mixing the recommended amount in a cup of water, tea, or juice. If you’re feeling wild, you can even take the dose straight into your mouth. Keep in mind that tinctures are usually made using alcohol, which can be uncomfortable in the mouth if it's not diluted. Hope you enjoyed and please leave your comments below! Ball, J., Thompson, D. R., Ski, C. F., Carrington, M. J., Gerber, T., & Stewart, S. (2015). Estimating the current and future prevalence of atrial fibrillation in the Australian adult population. Med J Aust, 202(1), 32-5. Atrial Fibrillation Investigators. (1994). Risk factors for stroke and efficacy of antithrombotic therapy in atrial fibrillation: analysis of pooled data from five randomized controlled trials. Arch Intern Med, 154, 1449-1457. Go, A. S., Hylek, E. M., Phillips, K. A., Chang, Y., Henault, L. E., Selby, J. V., & Singer, D. E. (2001). Prevalence of diagnosed atrial fibrillation in adults: national implications for rhythm management and stroke prevention: the AnTicoagulation and Risk Factors in Atrial Fibrillation (ATRIA) Study. Jama, 285(18), 2370-2375. Benjamin, E. J., Wolf, P. A., D’Agostino, R. B., Silbershatz, H., Kannel, W. B., & Levy, D. (1998). Impact of atrial fibrillation on the risk of death: the Framingham Heart Study. Circulation, 98(10), 946-952. Fuster, V., Rydén, L. E., Cannom, D. S., Crijns, H. J., Curtis, A. B., Ellenbogen, K. A., ... & Olsson, S. B. (2011). 2011 ACCF/AHA/HRS focused updates incorporated into the ACC/AHA/ESC 2006 Guidelines for the management of patients with atrial fibrillation: a report of the American College of Cardiology Foundation/American Heart Association Task Force on Practice Guidelines developed in partnership with the European Society of Cardiology and in collaboration with the European Heart Rhythm Association and the Heart Rhythm Society. Journal of the American College of Cardiology, 57(11), e101-e198. Röcken, C., Peters, B., Juenemann, G., Saeger, W., Klein, H. U., Huth, C., ... & Goette, A. (2002). Atrial amyloidosis: an arrhythmogenic substrate for persistent atrial fibrillation. Circulation, 106(16), 2091-2097. Gami, A. S., Pressman, G., Caples, S. M., Kanagala, R., Gard, J. J., Davison, D. E., ... & Somers, V. K. (2004). Association of atrial fibrillation and obstructive sleep apnea. Circulation, 110(4), 364-367. Garjani, A., Nazemiyeh, H., Maleki, N., & Valizadeh, H. (2000). Effects of extracts from flowering tops of Crataegus meyeri A. Pojark. on ischaemic arrhythmias in anaesthetized rats. Phytotherapy Research: An International Journal Devoted to Pharmacological and Toxicological Evaluation of Natural Product Derivatives, 14(6), 428-431. Thompson, E. B., Aynilian, G. H., Gora, P., & Farnsworth, N. R. (1974). Preliminary study of potential antiarrhythmic effects of Crataegus monogyna. Journal of pharmaceutical sciences, 63(12), 1936-1937. SChultz, O. E., & Haack, H. (1961). Isolierung Und Versuche Zur Konstitutionsaufklarung Von Drei Bitterstoffglykosiden Aus Leonarus Cardiaca. 2. Arzneimittel-forschung-drug Research, 11(10), 975. Miłkowska-Leyck, K., Filipek, B., & Strzelecka, H. (2002). Pharmacological effects of lavandulifolioside from Leonurus cardiaca. Journal of ethnopharmacology, 80(1), 85-90. Gao, Y., Zhou, S., Jiang, W., Huang, M., & Dai, X. (2003). Effects of Ganopoly®(A ganoderma lucidum polysaccharide extract) on the immune functions in Advanced‐Stage cancer patients. Immunological investigations, 32(3), 201-215. Socala, K., Nieoczym, D., Grzywnowicz, K., Stefaniuk, D., & Wlaz, P. (2015). Evaluation of anticonvulsant, antidepressant-, and anxiolytic-like effects of an aqueous extract from cultured mycelia of the Lingzhi or Reishi medicinal mushroom Ganoderma lucidum (Higher Basidiomycetes) in mice. International journal of medicinal mushrooms, 17(3). Xie, C. L., Gu, Y., Wang, W. W., Lu, L., Fu, D. L., Liu, A. J., ... & Zheng, G. Q. (2013). Efficacy and safety of Suanzaoren decoction for primary insomnia: a systematic review of randomized controlled trials. BMC complementary and alternative medicine, 13(1), 18. Elsas, S. M., Rossi, D. J., Raber, J., White, G., Seeley, C. A., Gregory, W. L., ... & Soumyanath, A. (2010). Passiflora incarnata L.(Passionflower) extracts elicit GABA currents in hippocampal neurons in vitro, and show anxiogenic and anticonvulsant effects in vivo, varying with extraction method. Phytomedicine, 17(12), 940-949. Singh, B., Singh, D., & Goel, R. K. (2012). Dual protective effect of Passiflora incarnata in epilepsy and associated post-ictal depression. Journal of ethnopharmacology, 139(1), 273-279. Jesse, C. R., Donato, F., Giacomeli, R., Del Fabbro, L., da Silva Antunes, M., de Gomes, M. G., ... & Souza, L. C. (2015). Chronic unpredictable mild stress decreases BDNF and NGF levels and Na+, K+-ATPase activity in the hippocampus and prefrontal cortex of mice: Antidepressant effect of chrysin. Neuroscience, 289, 367-380. Alijaniha, F., Naseri, M., Afsharypuor, S., Fallahi, F., Noorbala, A., Mosaddegh, M., ... & Sadrai, S. (2015). Heart palpitation relief with Melissa officinalis leaf extract: double blind, randomized, placebo controlled trial of efficacy and safety. Journal of ethnopharmacology, 164, 378-384.